A woman motorist who was seen hitting a vehicle as she manoeuvred out a parking space was found to be well over the drink driving limit. 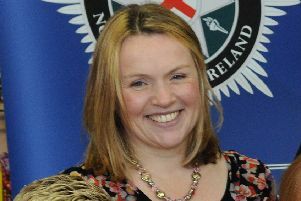 Anita Downey (50), whose address was given as Gilpins Mews, Lurgan, was banned from driving for 16 months last Wednesday at Craigavon Magistrates Court. She was also fined £150 and ordered to pay a £15 offender’s levy for driving with excess alcohol in breath on November 1 this year. The court heard that at 1.40am police were dealing with an incident in North Street, Lurgan, when they saw a vehicle collide with another car as it was manoeuvring out of a parking space. After it collided a second time police spoke to the defendant who was the driver. There was a smell of alcohol on her breath. Police removed the keys from the vehicle and an evidential breath test gave a reading of 95. Mr Conor Downey, representing the defendant, said she had been out socialising with a friend. He explained that she was trying to get out of a parking space and the incident was noticed by police. Mr Downey added that his client had been driving for over 25 years with no previous convictions and this was a source of great embarrassment to her and her family. He said that the reading was high and she realised the minimum ban may not apply in her case. District Judge, Mr Mervyn Bates, said the reading was almost three times the limit and the collision with another vehicle was an aggravating factor. But he ruled her suitable for the drink driving course and if she completes this her ban would be reduced to 12 months.